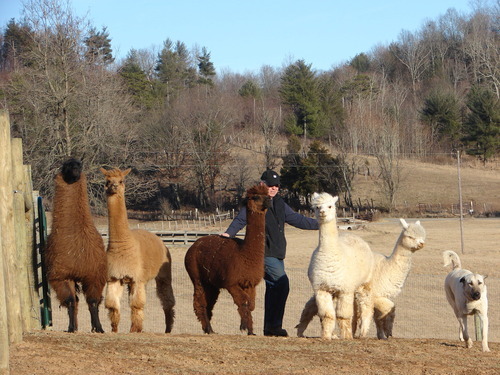 VAOBA: Ridge Valley Alpacas, LLC is a farm located in Fairfield, Virginia owned by Janis and John Conlon. 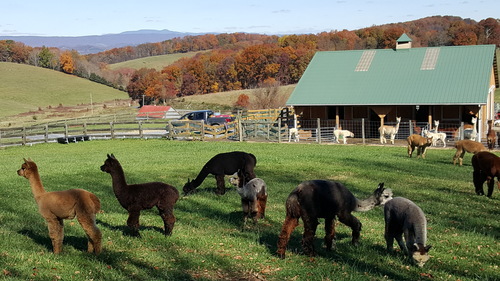 RIDGE VALLEY ALPACAS, LLC welcomes you to visit our farm in the Shenandoah Valley. We are located 2 1/2 miles West off exit 200 on Interstate 81. Our goal is to breed alpacas for Fineness, Uniformity and good Staple Length with a beautiful handle and consistency in their fleece. We have built our herd with award winning females from very experienced breeders, including West Penn Alpacas, Seven Springs Alpacas, A.L. Pacas, Crescent Moon Ranch, Flying Dutchman Alpacas, Amber Autumn Alpacas and other top quality farms. Lineages include Peruvian Accoyo Elite, Kirwin, Bisturi, ATV Adonis, Sheer Galaxy, Simba, Royal Fawn, Hemingway, PPeruvian Victor, Jeremiah, Augusto, El Nino, Caligula, Beethoven, Ringo Cloud, and Snowmass Royal Challenger, to name a few. In our continuing effort to improve our herd, we have acquired Champion Herd Sires for our breeding program. LBA's Theophilus is an 8X Champion, 7SAF Firestorm, an 12X Champion and 3X Judges's Choice recipient, A.L. Paca's All In Favor, a 5X Champion and A.L. Paca's Zamboni, a 3X Champion. Our commitment to the alpaca industry is to operate our business professionally and ethically and to actively promote the combination of high quality breeding and fiber product development. Breeding decisions are based on defined fleece improvement goals coupled with an honest assessment of genetic strengths and weaknesses of each animal in the herd. In 2018, we opened our alpaca clothing boutique, AbellaPaca Boutique. AbellaPaca Boutique at Ridge Valley Alpacas, LLC will be OPEN for your shopping pleasure on SATURDAYS AND SUNDAYS FROM NOON TO 4 PM. You are invited to come see the beautiful alpacas, take an Alpaca Selfie, and treat yourself and your loved ones to some wonderfully soft and warm Alpaca clothing.